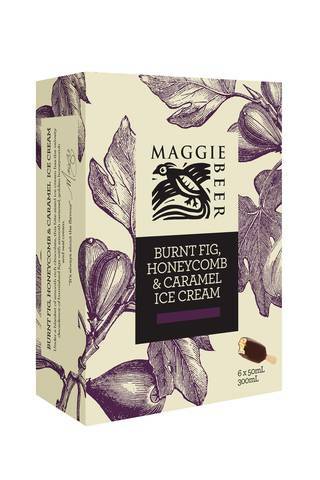 Under a blanket of smooth rich chocolate, this perfectly indulgent ice cream has the velvety decadence of burnished figs with smooth caramel, golden honeycomb and real cream. CHOCOLATE (32%) (COCOA SOLIDS, SUGAR, MILK SOLIDS, EMULSIFIERS (322 SOY, 476), FLAVOUR, SALT), CREAM (24%), MILK, SUGAR, BURNT FIG SYRUP (7.5%) (FIGS (95%), SUGAR, WATER, BROWN SUGAR SYRUP (BROWN SUGAR, WATER, VERJUICE (PRESERVATIVE (220)), LEMON JUICE)), HONEYCOMB (3.5%) (SUGAR, GLUCOSE (MAIZE), BUTTER, COCOA BUTTER, WATER, SODIUM BICARBONATE, GELATINE, VANILLA, SALT), EGG YOLK, SKIM MILKPOWDER, GLUCOSE (MAIZE), CARAMEL SYRUP (1.5%) (GLUCOSE, SUGAR, FLAVOUR, CARAMEL COLOUR (150a), NATURAL EXTRACT, VEGETABLE GUM (415), FOOD ACID (330)), VEGETABLE GUMS (410, 412, 407), CARAMEL COLOUR (150a), FLAVOUR. CONTAINS EGG, SOY, MILK PRODUCTS & SULPHITES. MAY BE PRESENT: GLUTEN, PEANUTS & TREE NUTS. CONTAINS NO LESS THAN 10% MILK FAT IN ICE CREAM. CONTAINS 40% COCOA SOLIDS AND 14% MILK SOLIDS IN CHOCOLATE.